Ocasio-Cortez’s Green New Deal calls for root-and-branch social and economic transformation. 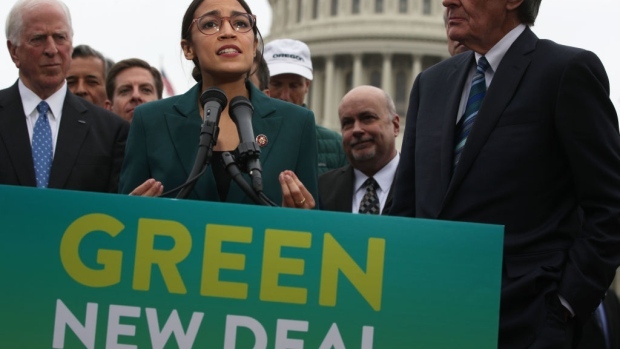 Taken at face value, its environmental goals are unachievable on the timescale she proposes – the U.S. cannot get to “net-zero greenhouse gas emissions” in 10 years, especially if it intends to rely only on renewables. (The European Commission has proposed net-zero as a goal for 2050, and even that is ambitious.) But the green components of the program are its least demanding. Ocasio-Cortez recognizes, indeed boasts, that her plan involves a sudden and radical restructuring of America’s economy and society, and aims to ensure that ordinary Americans don’t suffer as a result. Hence, new government guarantees of high-wage employment, health care, housing, higher education and economic security for all. That’s how you get to $7 trillion a year and up. The explanatory blog-post that resided briefly on Ocasio-Cortez’s website before being taken down – I’m assuming for the moment it was real and not planted by a malicious MAGA hacker – went further than the resolution drafted for Congress. Early draft or not, it surely makes you wonder about the mind-set of those involved. The question of financing is blithely waved away: The plan is an “investment program, not an expenditure.” The main concession to feasibility was to allow that it might not be possible to entirely phase out cows and aircraft within 10 years. All that was missing was the call for one world government, imagine no possessions, and let’s introduce a universal basic income for all personkind. I’m sure most Democrats – politicians and voters alike – would think that Ocasio-Cortez’s plan, taken as a whole, is unaffordable and politically unworkable. The reforms most would like to see are more cautious and pragmatic, hence more feasible and effective (though still bold by U.S. standards). The party has noticed, too, that moderates did well in competitive races in the midterms. Moderates could build on that success by using the banner of Green New Deal to advance a feasible plan for mitigating climate change. They could make “Medicare for all” a public-option plan that moves toward universal access and puts downward pressure on costs without instantly nationalizing a large part of the U.S. economy. Yet out of a mixture of timidity and condescension, many of those same moderate Democrats are refraining from criticism and letting Ocasio-Cortez and her followers hijack those causes. If they let this go on, it will be a grave tactical error. Progressive parties need a few radicals with wild ideas – and a lot of moderates to keep them firmly in check. Everywhere, but especially in the U.S., left-leaning parties do best when they combine ambition with clear limiting principles. Voters who see the need for change also want to see restraint, something Bill Clinton and Barack Obama understood.